Microsoft's Internet Explorer naturally comes with Microsoft's Bing as its search provider. That's easy to change and there are many alternatives. The default search in MS IE8 (and 9) is Bing of Microsoft. How do I change that? On one of my computers, I can click on the search engine that I want to use for that search. How do I get all of them to use Google or Bing? Can I add also more options like Wikipedia? It's really no surprise that Microsoft's Bing is the default search provider for Microsoft's Internet Explorer. And, to be fair, Bing's not that bad of a search engine. Unfortunately, Bing's garnered a bad reputation with some people by virtue of what I'll simply call over-aggressive marketing. Many people found themselves with Bing as their search engine, their home page, and sometimes even more - and all of it quite resistant to change. Even when it doesn't though, you may find yourself wanting to change the search engine used by Internet Explorer, or even simply add an additional search engine to those that are easily available. Many people don't realize that search is built into Internet Explorer. Rather than visiting google.com, bing.com, or any of a number of other search engine websites, you can simply type your search term into the appropriate field in Internet Explorer and press Return on your keyboard to perform a search. Regardless of which you use, enter the terms that you want to search on and press Enter on your keyboard; IE sends those terms to the default search engine that it's been configured to use. And, by default, that's Bing. 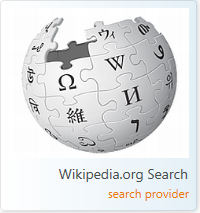 At the right of the search box or at the right end of the address bar is a magnifying glass icon indicating search and a downward pointing triangle indicating that there's a drop-down menu. Click that triangle. 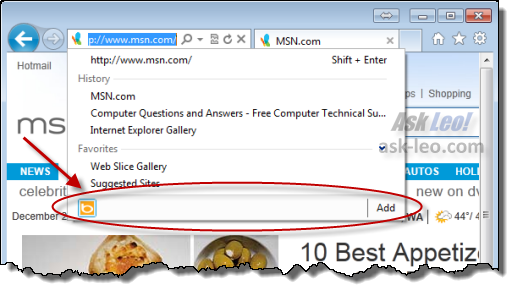 In IE9, you'll get a menu including several options. At the bottom will be a list of all currently installed search providers and a button labeled "Add". In IE8, the menu will look different, but near the bottom will be a "Find More Providers..." link. Click either Add or Find More Providers... depending on your version of Internet Explorer and you'll be taken to the Internet Explorer Gallery of Add-ons. There are many search providers. So many that we really need to use the Search function to find the one we want. Click that and search for "Google". You now have Google as one of your search providers. 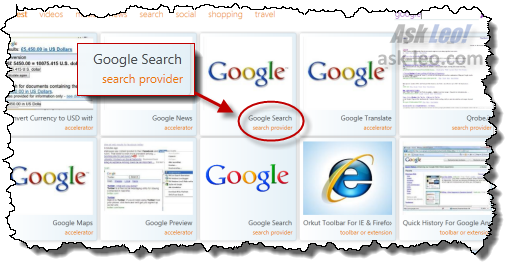 Highlighted are two icons representing the two search providers present: Bing and Google. Bing's is highlighted because it's the default - press Enter and that's the search engine that will be used. On the other hand, if you click on the Google icon, then the search is performed using Google. As mentioned above, you can set the default search provider as you install it. If you didn't do that, it's easy to change the default search provider later. Now all of your searches will be performed using the search engine that you've selected. In fact, there are many search providers, both general purpose (including a recently popular Google alternative DuckDuckGo) as well as domain specific searches like Wikipedia, local news stations, cooking sites, and even sites like Walmart. Spend a few minutes browsing around the gallery for some idea of what you might be able to find and use. How do I really get rid of all of Bing? Internet Explorer comes preconfigured with Bing as its search provider. Occasionally, IE ends up displaying Bing "accidentally". We'll change it. How do I get rid of the "Welcome to IE8" screen every time I start Internet Explorer? The IE8 Welcome screen allows you to set up a few initial IE settings and then it goes away. Apparently you MUST setup, or it'll keep coming back. Interesting article Leo, but the site http://www.iegallery.com/gb/addons/?feature=searchproviders does NOT allow the selection of Google as a search engine. As a result, I use Firefox wihich DOES allow you to select Google. Not sure what you're experiencing - the screen shots from this article are real, and show IE Gallery offering Google Search as a search provider. I note that you're doing to the "gb" version of the search (which did show Google search for me), but that is one difference - I'm in the U.S. and went to the "en" version. Bing stinks. To look for images where I can get more results I use Dogpile. I just bookmak the page and go to it when I want to search.